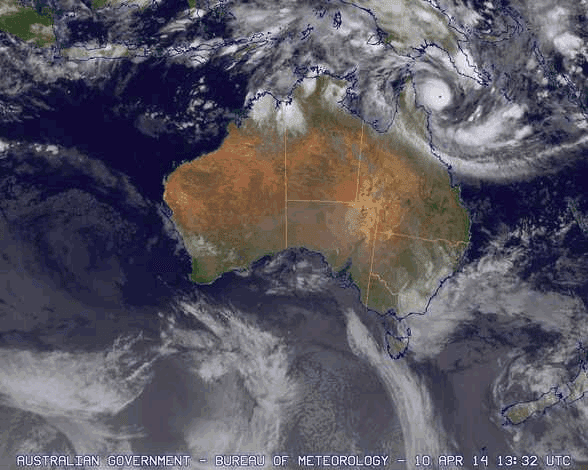 Tropical Cyclone Ita is a dangerous Category 5 heading for Far North Queensland. It's likely to hit the coast just north of Cooktown, which is north of Cairns. 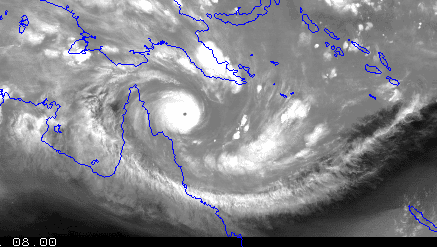 The cyclone is regarded as the worst since Yasi in 2011. 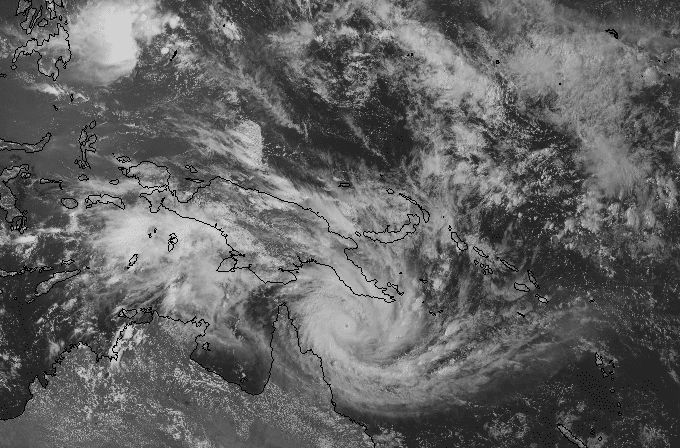 At least 23 people were killed when the storm hit the Solomon Islands, and up to 10,000 people were affected in what is reported as being "a natural disaster on a scale never before witnessed in the Solomon Islands". And that was when Ita was just a tropical low. If you are interested in how communities prepare, this page from Cairns Post has a good overview. It includes emptying hospitals of everyone who can reasonably be sent home, shutting up shops, opening emergency shelters, sandbagging and more. Update: Below is an animation showing how the cyclone is slowly moving toward the coast (Sat 11 April 2:00 pm). The rest are from the Space Science & Engineering Center, University of Wisconsin-Madison. In the longwave photo below you can clearly see the eye of the cyclone and how far the tail spreads. Here is the water vapour image. 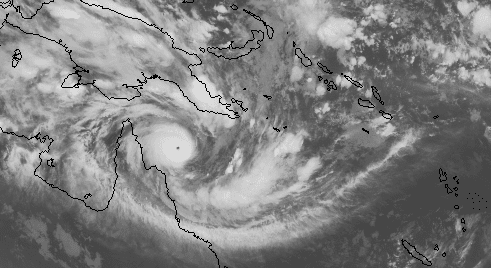 SEVERE TROPICAL CYCLONE ITA, CATEGORY 5, poses a significant threat to communities along the far north Queensland coast. At this stage it is expected to move to the southwest and make landfall between Cape Melville and Cape Tribulation later on Friday as a SEVERE CATEGORY 5 TROPICAL CYCLONE with VERY DESTRUCTIVE WINDS near the core and GALES extending some distance from the landfall location. DESTRUCTIVE WINDS may develop between Cape Melville and Cooktown from as early as sunrise Friday morning before extending inland to Laura and further south to Cape Tribulation and possibly Port Douglas later in the day. GALES may develop between Lockhart River and Cape Tribulation during Friday morning before extending further south to Innisfail and inland to Kalinga, Palmerville, and Laura, and Chillagoe later in the day as the system moves closer to the coast and over land. Coastal residents between Cape Melville and Cape Tribulation including Cooktown are specifically warned of the dangerous storm tide as the cyclone crosses the coast later on Friday. The sea is likely to rise steadily up to a level which will be significantly above the normal tide, with damaging waves, strong currents and flooding of low-lying areas extending some way inland. In an ABC report, something was written that made me think of Roger Pielke Jr. It was that "Cooktown residents are being warned that properties built before 1985 may not be able to withstand Ita's impact." It will be a difficult few hours and days ahead for far north Queenslanders. Stay safe. While we're on the subject of weather, most of you will probably have heard by now that the likelihood of El Niño was upgraded the other day. Now there is a greater than 70% chance of an El Niño this winter (southern hemisphere winter, that is 1 June to 31 August). That is very bad new, John. There will be a lot of damage. Cooktown is an old settlement with a long and important history, and has a lot of older buildings. I've also updated the BoM tracking chart as an animation. It suggests there'll be more rather than less damage in populated areas. Are you in FNQ John, or further south? I find it interesting how the ensemble of El Nino forecasts looks remarkable like CMIP 3 and 5 ensemble forecasts in shape. There's probably an educational point here about modeling and the use of ensembles. 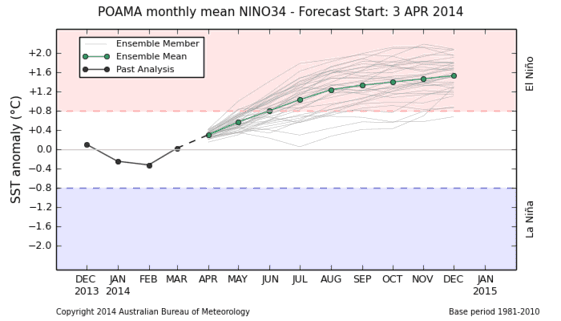 How does the forecast El Nino compare with previous events?